Ujwal Thapa is an entrepreneur and changemaker who started his journey as founder of DigitalMaxSolutions, an IT company. 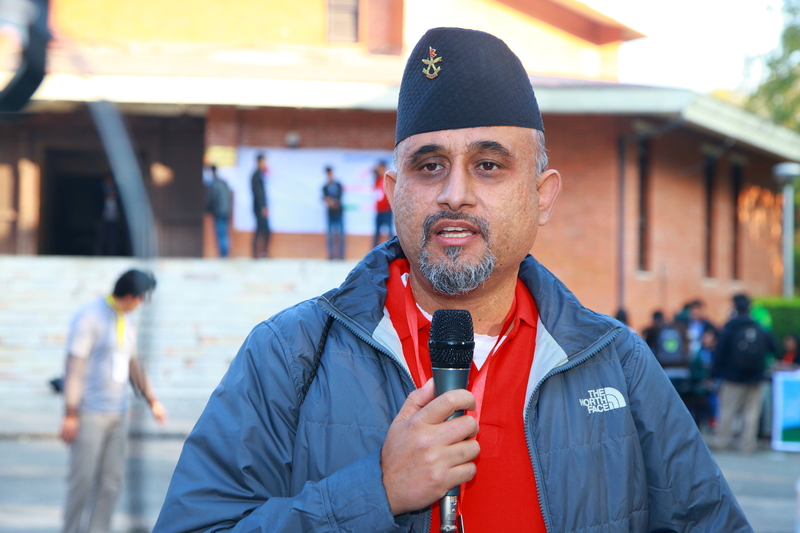 He is currently leading various social change initiatives in Nepal. Out of his many ventures, many are well-aware of the rising political force, विवेकशील नेपाली. We caught up with him at WordCamp Nepal 2015 and had a little chat about the WordPress community of Nepal. How did you get started with WordPress, and where did it take you? I got an email from a friend around 2006, about trying out this new tool, which was an early version of WordPress. I was working in IT and we were tired of building content management systems. We found out that this tool had a certain potential, we didn’t have to reinvent the wheel each time we built something for our clients. That’s how we got started in 2006; I believe we were one of the first companies to use WordPress in Nepal. Fortunately, all the people that were involved in our company were very bright young people who really found a lot of flavor. A lot of us, founders of the WordPress Nepal came from that era, like Chandra Maharzan and Sakin Shrestha. We decided to do more with this wonderful platform, and decided to slowly start involving the community. We believed that unless the IT community is strong, we will not be able to create much of an impression in the international community who we relied upon for work. That is how everything got started. We started doing meetups, and educating college students about WordPress, because we really believed this had potential for Nepal. How are you feeling about where it has come today? It’s amazing. We never thought we could rise this high. We have a very active group of nearly 5,000 people on facebook who are actively helping each other. A lot of our developers and designers have been renowned worldwide for their themes and plugins, and we are even contributing to the core now. So, I believe Nepal and Nepali developers will be a shining example of how persistent young smart people can rise beyond the chaos around them to really create a positive impression for their own selves and their country. It is a really amazing example of how we can persevere despite the odds. What’s your proudest achievement related to WordPress? My proudest achievement is building this community. That is not just creating tens and hundreds, but thousands of jobs in Nepal, and has the potential to create tens of thousands more, which basically means we are contributing to the nation by creating opportunities where there are none. Is there anything that is aggravating you about WordPress, or making things difficult for developers in Nepal? I think this is not necessarily related to WordPress, but because we work mostly with international clients, we have problems with payment gateways, and how to get money in and out. If this was easier, it would create tens of thousands more jobs in Nepal. Lots of young people are fascinated with anything and everything IT, and a great thing is you can start from your home. WordPress has created a platform, obviously, the more interaction we have with the international community, we would create more opportunities. Maybe more interaction with the global community. I think Nepal is a special case for the community because it could be a shining example of how WordPress has transformed an entire culture and environment. I think it is an excellent opportunity for the WordPress community to invest, especially in a country like Nepal where many people have given up hope. Two basic pieces of advice for people who want to get started with WordPress? First of all, join the WordPress Nepal facebook group, because that is where you can harness the energy of thousands, on simple problems that you have. Just post questions there. Second, start coming to meetups, and ask questions, because people really want to help. Especially our community knows how much WordPress has given them, so they want to give something in return, so make use of it. What are your top 3 WordPress plugins? I use JetPack. You won’t fail with JetPack. The second would be WordPress SEO. Just to make sure my site is SEO optimized. Akismet, the spam filter, but it comes by default. I use Facebook Plugins because it connects me directly to my facebook page. What is your favorite WordPress related resource? I usually go into WordPress development updates. I want to know about what developers are working on and what new features are coming. I sometimes look at the theme galleries, because I love simplicity, and am always looking for simple WordPress themes. I look at WordPress.org and Smashing Magazine. What is the vision for WordPress Nepal? For future WordCamps? The vision is to get the meetups all over Nepal. We have done things in the past in Biratnagar and Pokhara. We want to do something in Hetauda and Chitwan, and also go to the Far West, because we really believe that this is not just an Information Technology tool, but this is actually a movement for positive change that can bring prosperity to tens of thousands of Nepalis, and through them tens of thousands of families. That’s how leadership is born. We think of this as a movement that will produce the leaders needed to build a prosperous Nepal. That is our big vision. We want to do this by showing results. Tell us something about you that isn’t WordPress related. I believe I am a provoker. I believe that the easiest way to bring change is to align all the positive people in the same direction. So my job is to provoke and bring together people with similar interests, and align them in a similar direction, creating the change that they would never believe could come.